I love this verse, because David is not speaking about God, but actually to God……God’s nearness is something we can actually experience. The book of James says, “Come near to God and he will come near to you.” Imagine, a God we can actually have a personal experience of nearness to. The beauty of how God speaks to us is revealed in the many different ways He speaks to us as individuals. I have written before about the robin appearing at dawn on the awful day after my husband died, and the snow white dove appearing on my parents window sill as they were praying. I have been lamenting the loss of my little cactus wren. When the cactus came down, “wrenny” flew the coop. 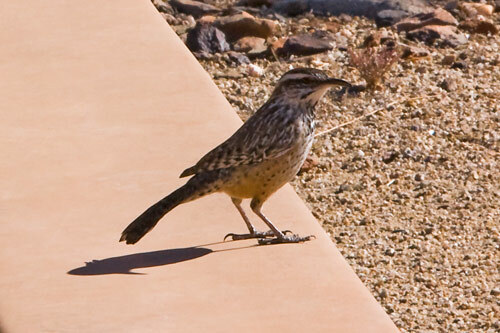 Cactus wrens are very industrious and fun to watch. They are always busy, always working. I would see him hopping up and down the sidewalk, collecting nest material, finding food. They have a very interesting call and I have missed seeing him perched on top of the Saquaro. Usually I wake with the mourning doves, their soft cooing has become my morning “collect.” I have grown very used to the sound of them accompanying my prayer. Yesterday I had a different visitor. He was perched right above my neighbors door and sang there non-stop for about 30 minutes. I have no idea what kind of bird he was, but he was there, singing God’s praises to me loud and clear. I heard him this morning also, a good distance away. But yesterday he was there for me, and so was He, in the lowly form of a little bird. God speaks, we only need to have hearts and ears to hear. This entry was posted in Animals, Encouragement, God Moments, Nature. Bookmark the permalink.